A small, expressive subtractive synthesizer. 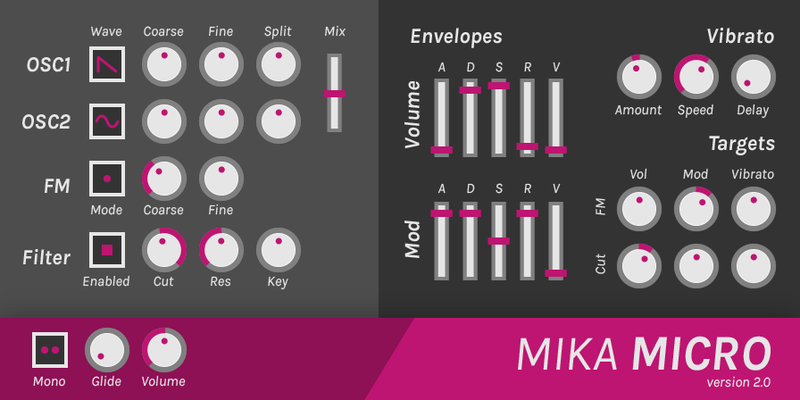 Mika Micro is a subtractive synthesizer plugin that aims to be fun and expressive with a minimal set of controls. Mika Micro is free and open-source - check it out on GitHub! If you like manuals, you can read one here. Note that Mika Micro is an audio plugin meant for use with DAWs such as FL Studio or Ableton Live, not a standalone program.